I've been thinking about what to write for this day. Should I stay silent and not post at all? Should I come up with some "in remembrance" post? It's all still so fresh in my mind - hard to believe a year has gone by since that day. I was three months pregnant at the time and had yet to announce it to the world. David (my husband) was at work just down the street. Parked in front of a space heater and bundled up in fleece, my typical winter attire, I was working away on my laptop. As I was typing, I started feeling a little dizzy. I looked up, over towards the sliding glass doors that lead to our balcony. Some of the empty clothes hangers I had hung on the curtain rod were swaying. I glanced at the hanging light in the middle of the room. It too, was swinging back and forth. Then I realized it wasn't me and my pregnancy hormones feeling lightheaded - it was an earthquake. I sent a text to my husband and hopped on Twitter. 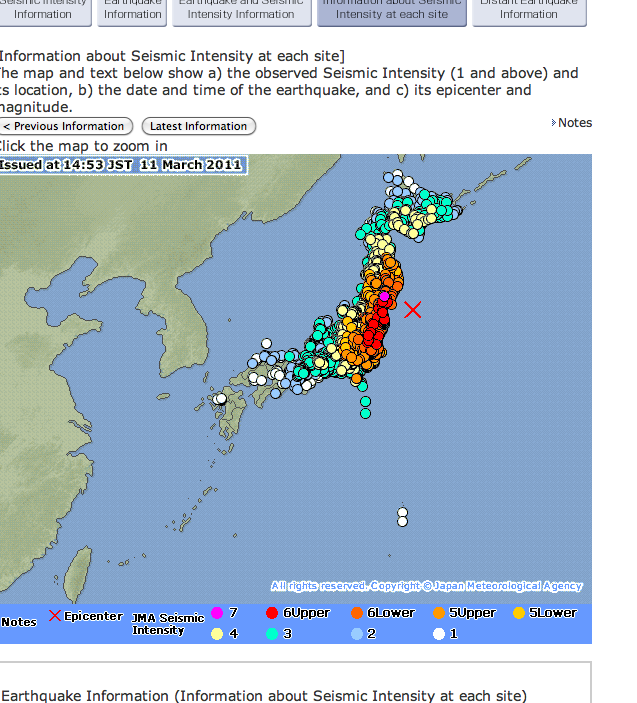 Sure enough, this quake was being felt not just in Shizuoka, but in Tokyo and beyond. Rolling, rather than shaking, and it lasted a lot longer than any previous quake I had felt. This earthquake had shaken almost the whole country. I flipped on the TV, and noted my husband still hadn't responded. Tried calling, but calls weren't going through. Then the images: a wall of water; giant ships being tossed around like toy boats in a bath tub; it kept rushing forward and didn't seem to stop. The last time something had felt this surreal to me was 9/11. For the next two weeks I was online, on Twitter, blogging, etc., all day, every day, with the exception of one day my husband and I actually went out for a walk. My Twitter handle took on new meaning (@survivingnjapan.) It didn't feel right to me to do anything else but try to help in any way that I could. But I mostly felt helpless. This could have been us. The thought circled through my mind numerous times. When I came to Shizuoka we were constantly warned about the Tokai earthquake, expected to be the next "big one" in Japan. As in, the scale of the Tohoku quake. Just a few different tectonic plates and we would have been in the same position, and I would have been pregnant, wondering what in the world would happen to us. The nuclear crisis did bring about questions. We live pretty far from the plant - farther than Tokyo, so we weren't all that concerned, but did consider that if the situation became more dire, we would have to do something about it. Especially with this tiny being inside of me, I can tell you my mama radar was on full alert. I was already doing everything possible to protect this baby, and I wasn't about to let some situation I couldn't control compromise that. But enough about me. I haven't ever felt like this was about me. I felt hesitant when foreign media would ask for interviews, as they all scrambled to find people in Japan to talk to about the whole situation. I focused on working to provide resources to others. The stories that have come from the people living in Tohoku, and those who evacuated, have been heartbreaking. Whenever I read of a lost or missing loved one, especially if it was a parent or child, I cry. (I'm an emotional person in general - I cry pretty easily). My heart goes out to all those kids who lost their parents; I just want to be there with them and play with them and give them some love, even though I know it's nothing compared to what they lost. My heart aches for every mother or father who lost a son or daughter. I hug my daughter a little tighter at those times and tell her I love her, even though she's usually wriggling to free herself so she can go scoot around the bed or floor. One story in particular mentioned a group of parents who were suing the kindergarten their children had attended, because the school bus took 12 kids home from the school (which was on high ground). After dropping off seven of the 12, the bus was washed away in the tsunami. One of the mothers had a daughter named Airi. Airi is our daughter's name. Or the women who gave birth on March 11; I can't even imagine how stressful that must have been. I doubt I would have been able to stand it - childbirth was hard enough, but with a huge earthquake and tsunami? I admire those women. That doesn't even begin to cover the thousands of other stories. So today, I don't really have much else to say. I hope we can remember and think about what happened that day and remember those who have been affected by the devastation on March 11. Losing loved ones. Losing their homes. Losing their jobs or livelihood and life as they know it. I mean, what if it had been us? What if it had been you or I? Let's continue to offer our support however we can. And thank you to those who have done so thus far.